"I think her name was Freda, a girl at my school, same age as me only about 5. We brought an Urn for the grave, the whole school contributed a few coppers- nobody had much money. The house was on Kinder Road where you go down Watery High, get down to the Rec (in Hayfield) from there. Freda and a lady collecting insurance were killed. The plane had been shot, it was trying to gain height when he dropped the bomb- then later crashed onto Kinder. I was playing with friends on the Rec, the recreation ground, playing on the swings, very exciting at the time. Topsy, Top, Tails, swinging upside down on the railings outside the Royal… (she only wanted to show her knickers)"
This morning I was back at The New Mills Volunteer Centre's, with The Handicraft Group. 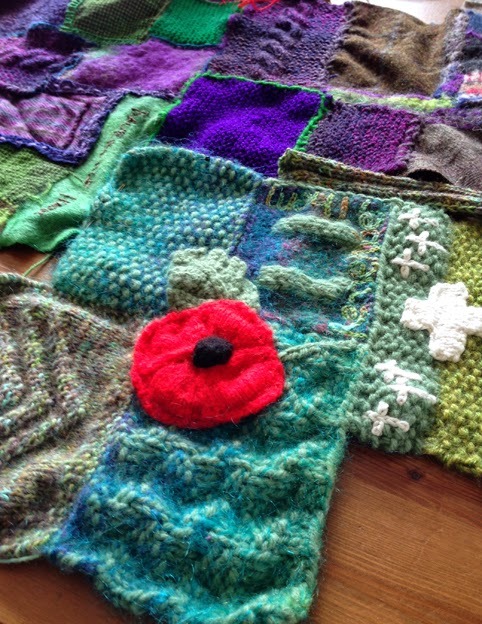 We chatted, reminisced, drank tea, eat biscuits, knitted and wrote out lines of reminiscence to be embroidered onto the Stitching the Wars quilt at a later date. Two of the reminiscences I have added here. "People would give Granny white feathers when she was out shopping. 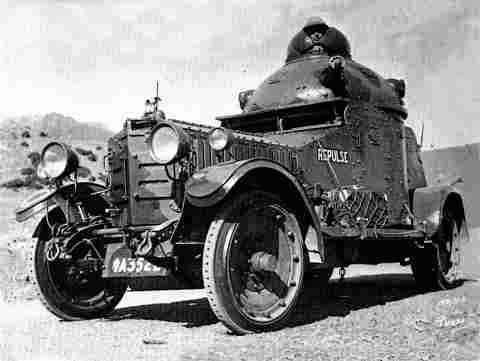 My Grandfather Joe Jones, he was a skilled engineer, worked at Crossley Motors, Levenshulme during the 1st World War, so was exempt from fighting. A centre Lathe Turner, a very skilled job, using the milling machine to a 1000th of an inch. They were making engines for Military trucks. It caused a lot of problems. They had a big Victorian House with a porch, they used to find white feathers there, all lined up." A member of the group, Sandra kindly donated a 5 panel knitted artwork to add to the quilt, inspired by the projects theme Derbyshire land and the wars. One panel is knitted with chevrons, to symbolise the service mens uniform, others are knitted with ribs to reflect the land, a poppy and crosses directly link to the war. 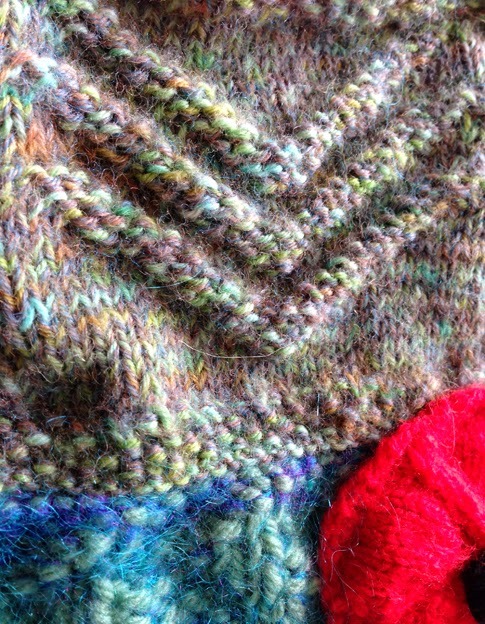 Sandra's knitted panels pined to the larger embroidered wool quilt. 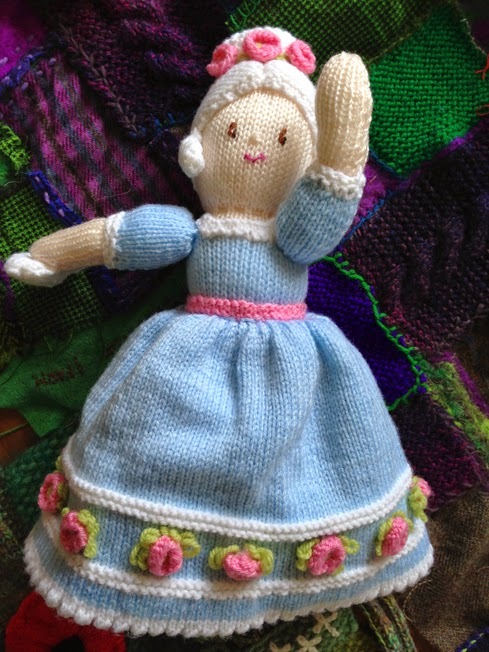 On a personal note, I couldn't resist buying a Cinderella Topsy Turvy doll one of the ladies had knitted. 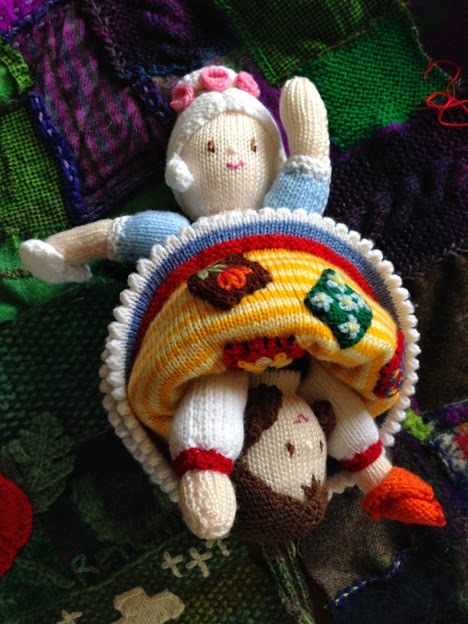 If you are ever in New Mills, do have a look in the New Mills Volunteer Centre window, its full of knitted gems and all the money goes back into keeping the group going.